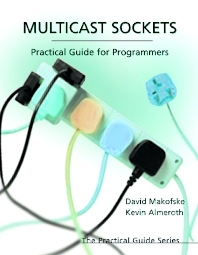 Multicast Sockets: Practical Guide for Programmers is a hands-on, application-centric approach to multicasting (as opposed to a network-centric one) that is filled with examples, ideas, and experimentation. Each example builds on the last to introduce multicast concepts, frameworks, and APIs in an engaging manner that does not burden the reader with lots of theory and jargon. The book is an introduction to multicasting but assumes that the reader has a background in network programming and is proficient in C or Java. After reading the book, you will have a firm grasp on how to write a multicast program. David Makofske has over ten years experience as a software engineer and consultant, with an emphasis on IP network and web development. He received his Masters degree in computer science from the University of California at Santa Barbara, and is currently a senior solutions architect at Akamai Technologies. Dr. Kevin Almeroth is an associate professor at the University of California at Santa Barbara. His research interests include computer networks and protocols, multicast communication, large-scale multimedia systems, and performance evaluation. He has been working on multicast since the early 1990s when it was first deployed on the Internet. In addition to his research, Dr. Almeroth is an active participant in several Internet Engineering Task Force (IETF) working groups, has helped manage multicast for Networld+Interop as part of the NOC team, and is the multicast working group chair for Internet2.